I love cooking with caramelized onions. They have a rich, complex flavor which is suited to many applications. They are the basis of dishes like classic French Onion Soup and and Pissaladiere. Caramelized onion can also be used stews and braises, in making bread and as a complement to meat. On a recent trip to France, we discovered a natural affinity for chevre cheese and figs so, bringing these flavors together, I invented the following recipe. Peel onions, halve and slice into 1/8th inch slices. Place in a bowl, sprinkle with salt and let sit for 5 - 10 minutes. Heat a sauté pan to medium heat and add the olive oil. Add the sliced onions. Sprinkle on the salt. Toss. Cover and allow to steam down, 10 - 15 minutes, being careful to reduce the heat if they start to brown. Remove the cover, and continue to cook the onions down, stirring frequently and progressively reducing the heat as they brown, until they are evenly softened and browned to a mahogany color. The volume will be greatly reduced. Allow to cool. Place tart shells onto a cookie sheet. Give the caramelized onions a rough chop just to remove any long pieces and then divide evenly among the tart shells. Divide the chevre evenly among the tarts, spreading it, if possible, to cover the onions. Top each tart with 1/2 teaspoon of the fig jam. 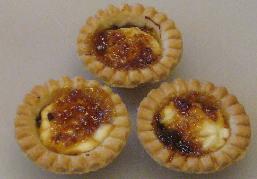 Bake tarts for 20 to 25 minutes, until the edges of the tart shells are lightly browned and the jam is bubbling. Remove from oven and allow to cool before serving. In place of the second step above, you can toss the onions with the salt and then microwave on high for about 15 minutes until they soften and reduce to about three quarters their original volume. Place the onions and any liquid into the oiled pan and proceed as in step 3. As they caramelize, the onions will reduce down a much smaller volume, as shown in the following pictures. In these pictures, eight large yellow onions, about 5.3 pounds (2.8 Kg) were caramelized, resulting in about 2 1/4 cups (530 ml) of finished product. 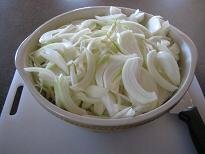 The two onions in the recipe should yield about 9 tablespoons, or about 1/2 tablespoon per tart. Don't spend extra to buy sweet onions for caramelization. By the time you are done, the sharp sulfur compounds will have cooked off completely, so use the least expensive onions you can find.